Many thanks to Rafael Reca and Jonny Penn for the following photos. 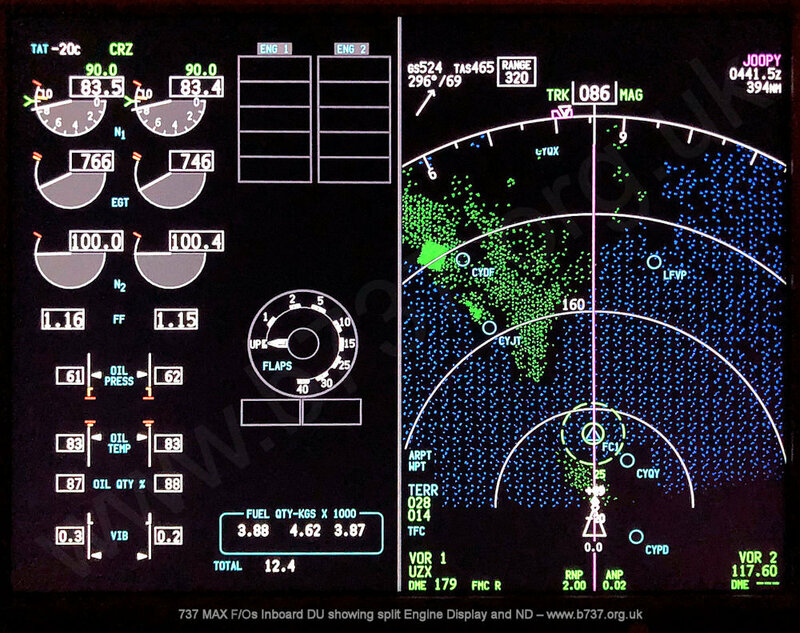 The main change to the MAX flight instruments is the replacement of the six 7.1 inch DUs of the NG with four 15.1 inch wide LCD DUs. 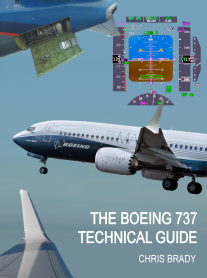 This has necessitated the relocation of the standby flight instruments and gear lever to the center and moving some controls, eg autobrake selector, down to between the FMC displays. 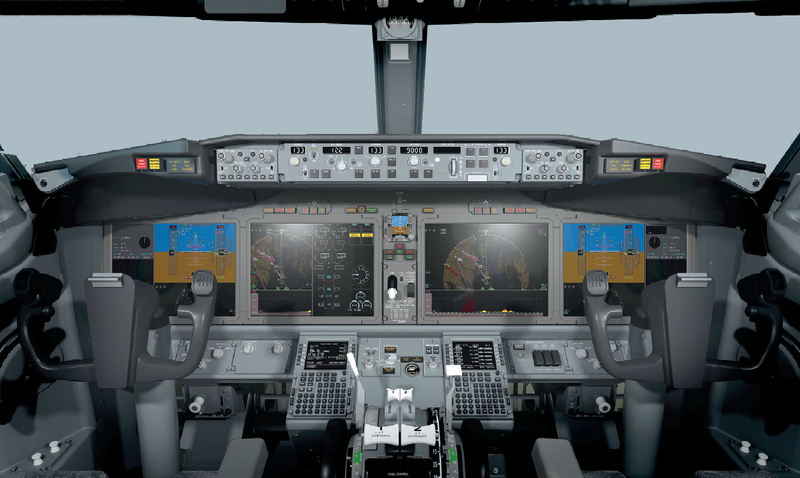 Follow this link for more details of the MAX flightdeck layout. 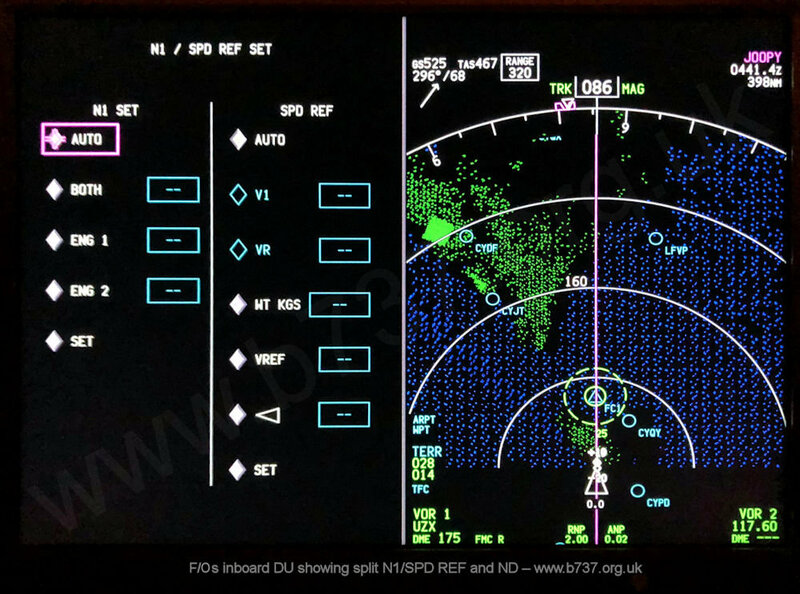 The four DU's are known collectively as the MAX Display System or MDS. The photo above shows the normal arrangement. From left to right: Aux - PFD (with compass below) - Half-size ND - EIS - Full-size ND - PFD (with compass below) - Aux. 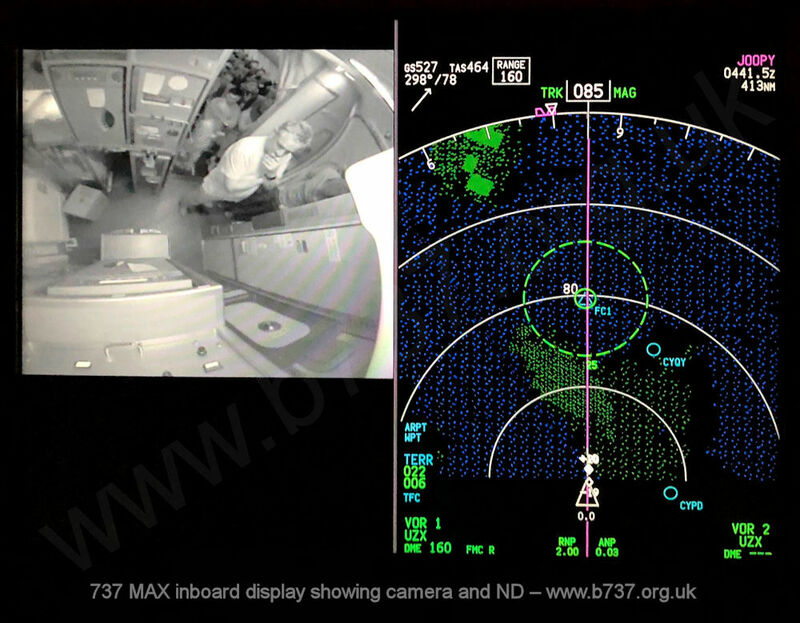 MAX Display System, showing the F/O inboard and outboard displays. 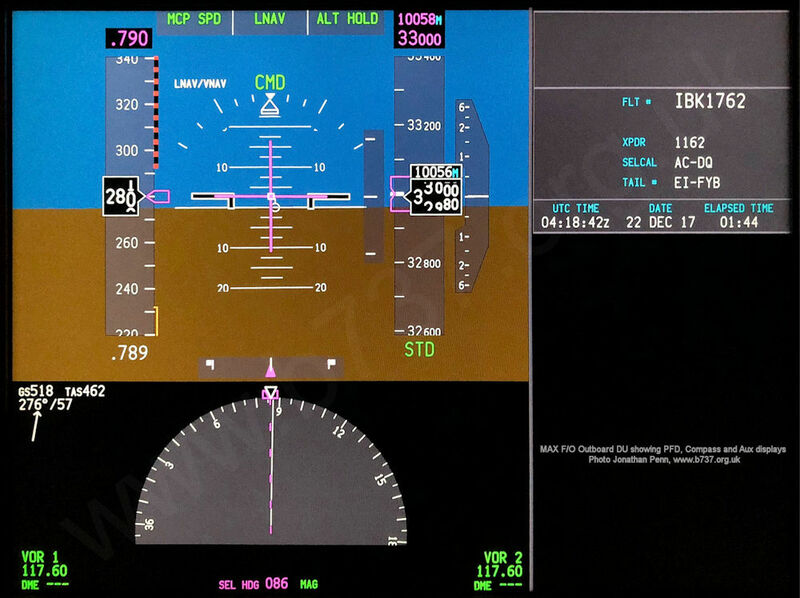 From left to right: Engine displays, Half size ND (in map mode), PFD, compass and Aux display. The PFD is normally displayed on the inboard side of each pilots outboard DU. The layout and symbology is unchanged from the NG. The inboard side of the outboard DU is called the Aux display and has data such as flight number, transponder code, selcal, registration, clock and the HGS annunciations if installed. The navigation display is normally displayed on each pilots Inboard DU. The Captains is normally a half size ND split with the engine display. The F/O normally has a full sized navigation display as shown below. The layout and symbology is very similar to the NG. 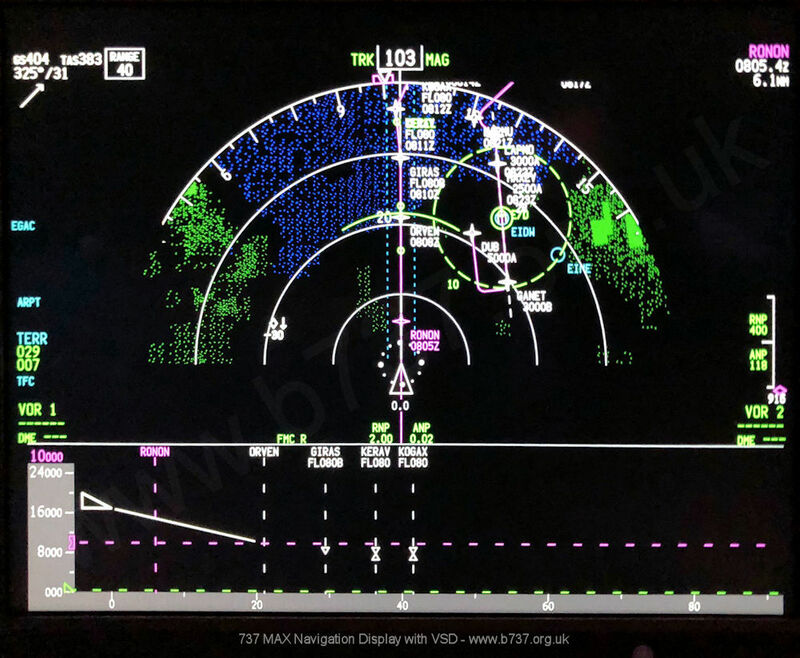 Notice that the selected map range is displayed at the top left, this is because the range selector on the MAX EFIS Control Panel only shows + or -, not the actual range values. The maximum selectable range is 640nm. 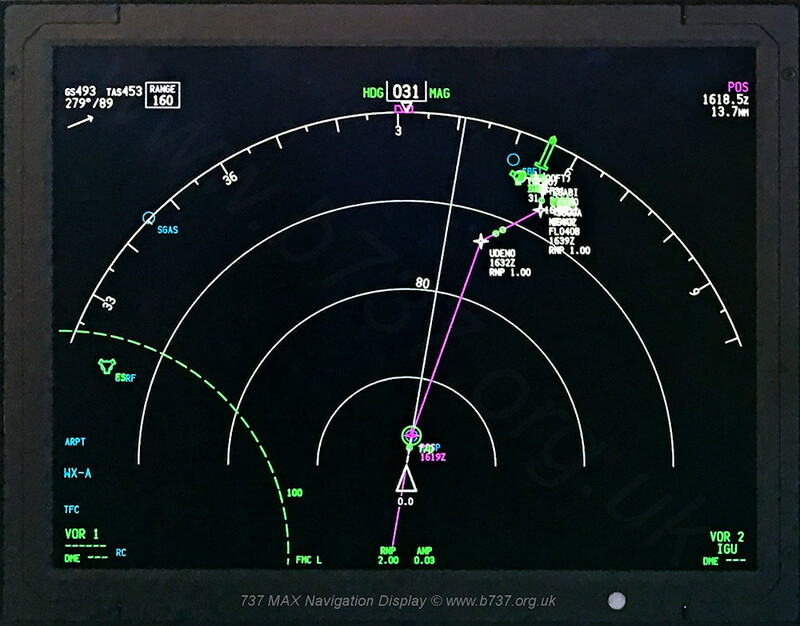 Vertical Situation Display can be shown below the map by pushing the VSD button on the EFIS Control Panel. 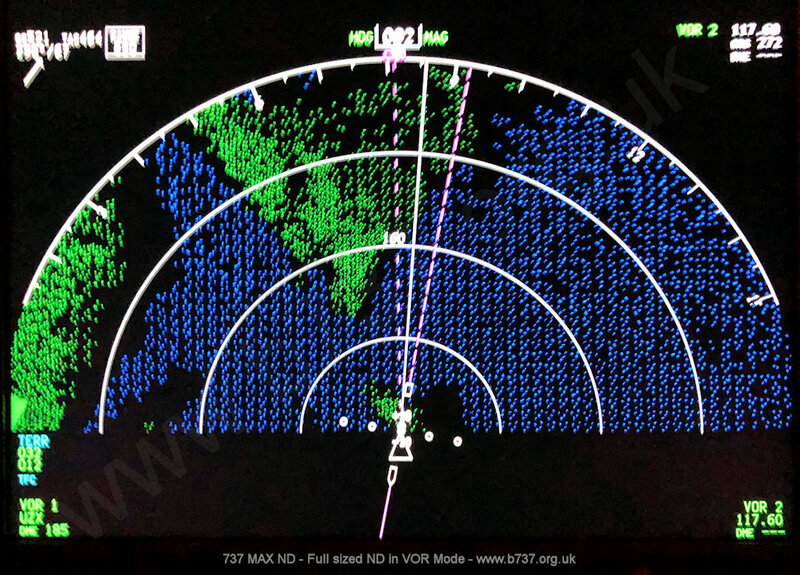 Note that it shows twice the range of selected map range so the maximum VSD range possible is an impressive 1280nm. Expanded or centre VOR (or Approach) modes are available although very rarely used these days. Plan mode is the same as the NG. 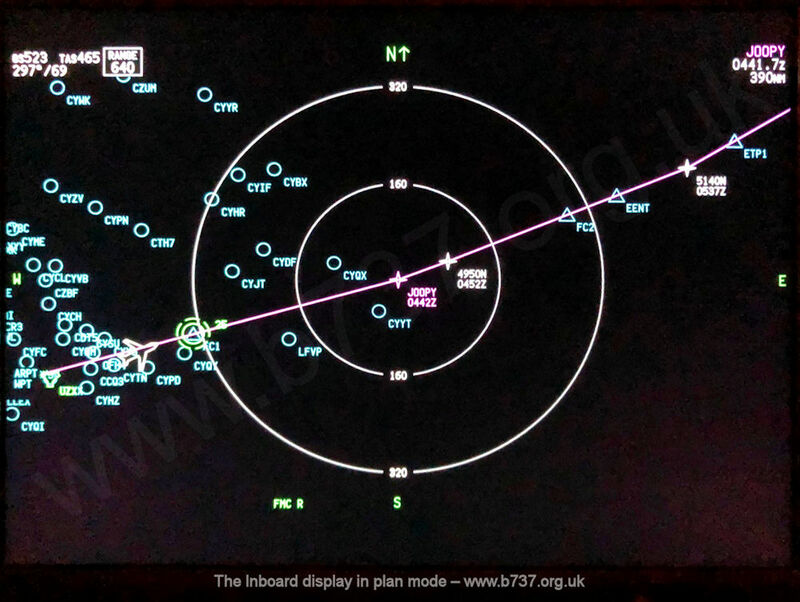 The plan in this photo is transatlantic and shows fuel check waypoints (FC1 &2) and the Equal Time Point (ETP1). This display is reached by pressing ENG on the MFD selector. The F/Os ND changes to half-size and the primary and secondary engine instruments are displayed inboard of the ND. This display is reached by pressing SYS on the MFD selector. The F/Os ND changes to half-size and the systems are displayed inboard of the ND. This is the F/Os Inboard DU showing split Hydraulic qty & pressure and Brake temp and tyre pressure (not shown in this photo) and ND. The Brake temps range from 0-9.9 and above 4.9 is considered hot. The individual tyre pressures will be shown either white (normal) or amber (abnormal). Abnormal is a pressure below 100psi or a difference between two main gear tyres of 25% or a difference between two nose gear tyres of 12%. These conditions will illuminate the associated BRAKE TEMP or TIRE PRESSURE caption on the fwd aisle stand. 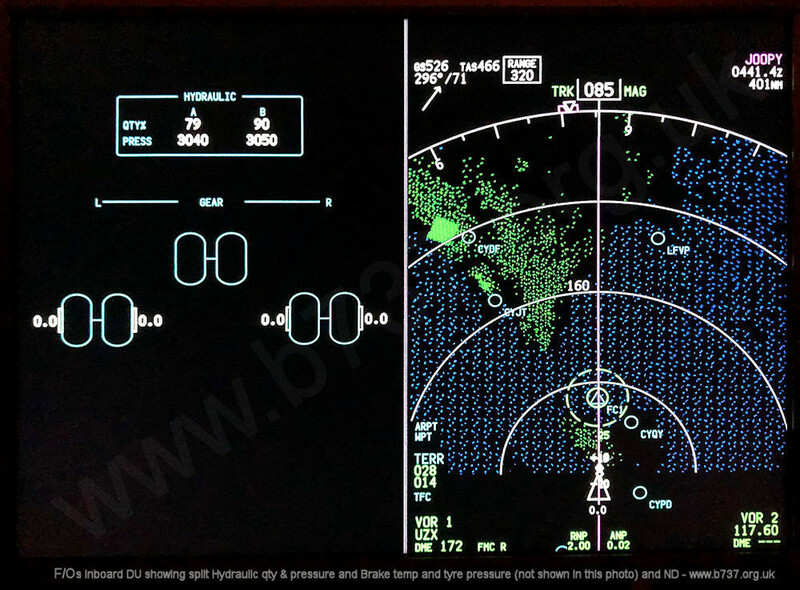 There is also an option to display the flight control surface position indicator with the other systems here. This display is reached by pressing INFO on the MFD selector. The F/Os ND changes to half-size and the N1 /Speed Ref are displayed inboard of the ND. This performs exactly the same functions as the Speed Reference Selector on the NG. You cycle between the fields (shown as diamonds) and enter values in the blue boxes using the SELECTOR knob on the forward aisle stand. This display is reached by pressing INFO on the MFD selector. The F/Os ND changes to half-size and the Video Surveillance camera views are displayed inboard of the ND.